By Elson T. Elizaga. Published Feb. 15, 2018. Also in Mindanao Goldstar Daily. A small Karate class started only in 2017 in Barra, Opol but three of its four students already won top prizes in the recent Karate tournament organized by the Private Schools Athletic Association (PRISAA). This feat isn’t a surprise because their sensei is “the legend” Gabriel Operanta. Operanta walks in Bulua and Opol usually unnoticed by locals. Baklay-baklay lang. He limps because of an injury in his right knee. Sometimes, after teaching Karate, he buys fruits from the sidewalk before heading home. Nobody would suspect that Operanta is an 8th degree black belt Shotokan Karate expert from Cardiff, Wales. He earned his black belt from Keinosuke Enoeda, Japanese master of Shotokan Karate and former chief instructor of the Karate Union of Great Britain. Already 70-years old, Operanta is a former manager and coach of Wales National Karate Team and Karate Union of Great Britain International. He has been Wales’ national champion many times. Operanta is the founder of the Welsh Shotokan Karate Association which produced a hundred Welsh champions, one of whom was Yasmin Johnson, who won 27 Welsh and 10 British championships in kata and kumite. 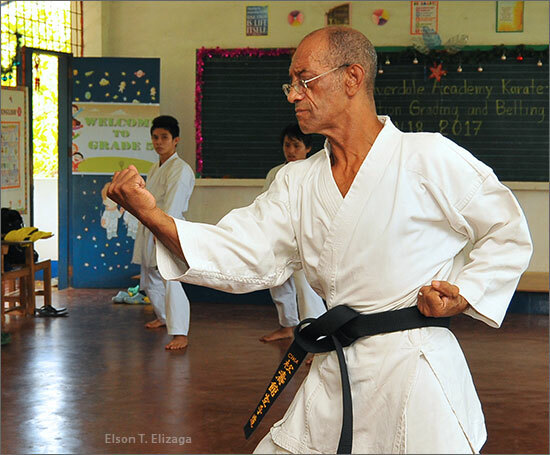 In Wales, Operanta would receive the equivalent of P3, 000 per hour teaching Karate to some 30 to 60 people, but here he asks only P35 per student per hour, for the love of teaching Karate. He wouldn’t mind showing up in class even if only one student is present. 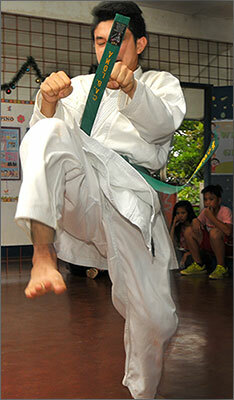 Operanta is the president and chief instructor of Champions International Karate Association (CIKA) in the Philippines. He is married to a Filipina teacher, Jennilyn Pecasis. They have two children. “My overall view is that for a child it is almost as important as going to school. They take in discipline, physical exercise and learn about philosophy. We have a philosophy in Karate which ties in with the physical side and the mental side. In Karate you are always being pushed further to be physically fitter, mentally fitter and stronger and morally better. Last week, I observed Operanta trained three students, including my 9-year-old son, Diego. And I heard Operanta repeat the same words he had told BBC. And I realized Karate is not about making someone become a screen hero like Bruce Lee. Karate is about becoming a better person, indeed, and everyone, even those with physical disabilities, can learn it. Part of the benefits of Karate is improving mind-body coordination. A good example is a dyslexic student who, because of Karate, successfully graduated in a university and became a teacher. The parents were so happy they wrote Operanta a thank-you letter. "We are lucky and blessed to have sensei Gabriel as our teacher. I'm improving because of him. He pushes me beyond my limits. And I'm happy that he keeps telling me never to give up." I asked Operanta if Karate can help in the rehabilitation of drug addicts. He said everyone can benefit from Karate, but he would not teach Karate to people with criminal intent. When I agreed to support my son Diego’s plan to enroll in a Karate class, I didn’t realize Karate had a serious philosophy and code of ethics. All I wanted was for Diego to chop firewood with his bare hands. (“Just give him an axe, Elson!” my friend Tony Hernandez told me in Facebook). But I’m glad that Karate is much more than that. If you have depression, if you feel lost, if you want your life to have focus and control, if you want to have self-confidence, if you want to be certain you can handle physical and mental pressure in any kind of job – as teacher, doctor, journalist, or president – study Karate. And then you will also learn something very important. “In Karate, the rich man bows to the poor. We bow to one another. We respect one another,” Operanta said. Congratulations to Operanta’s three students who showed their best in the recent PRISAA Karate tournament: Chris Lhann Adrian B. Loma (gold1), Alrhadje Mamaki (bronze), and Dean Cassiel Sablad (gold and silver). They are students of Riverdale Academy in Barra, Opol. 1 Not gold and silver as reported earlier.